While challenging yourself by setting high expectations and goals is always good, it's also important to keep your resolutions realistic. According to a study out of the University of Scranton, only 8% of Americans are successful in achieving their New Year’s resolutions. 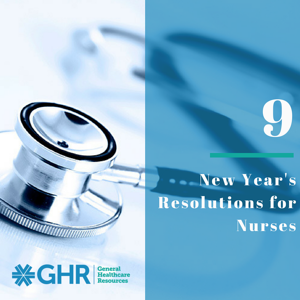 To help you set and achieve your goals, we’ve put together some New Year’s resolution ideas for nurses to kick start your personal and career goal setting in 2019. As the U.S. healthcare system continues to change, nurses’ positions are requiring advanced knowledge and specialization certifications in order to lead effectively. One of the best investments you can make as a nurse is expanding your skill sets and advancing your degree. Whether you are working towards your BSN, MSN or a specialty certification, the opportunities within the nursing field are practically limitless, which can be part of the challenge. If you’re not sure what direction you want to take in your career, invest some time this year to get to know yourself. Spend time reflecting on what you want in a job. Research areas of study, programs available and what is required to help you achieve this next stage in your career. Nurses possess unique skill sets that can help communities in ways that most professions can’t. In 2019, dedicate some of your free time to giving back to your community by volunteering with local organizations that provide health screenings and wellness evaluations. Giving back to your community through your profession offers a great opportunity to help others. In addition, consider getting involved with professional nursing organizations that work to impact legislative issues that affect the profession or guide new graduates into the field. Professional nursing organizations are a way to create connections while making an impact on the industry. Nursing practice laws and regulations vary state to state and change periodically. Make it a point this year to stay up-to-date on the latest news, legislation and advancements. Bookmark this page on state legislation, set up Google alerts around nursing related topics for your email inbox, or sign up for nursing publication sources to stay connected within the industry. Victims of human trafficking or domestic abuse frequently interact with the healthcare system. However, abuse of this nature sometimes shapes an individual’s comfort level, trust and overall attitude towards healthcare providers. Therefore, for the well-being of these victims, nurses should be educated on identifying patients who are at-risk and be prepared to care for the trauma associated with the wrong that has been done to them. Imagine the difference that could be made if all nurses were as informed about human trafficking and domestic violence as they are about wound care or diabetes management? Inspire change within your healthcare facility by working to build a trauma-informed staff. Attend a trauma and abuse training course in 2019 to learn about the warning signs of human trafficking or domestic violence. As front-line caregivers to patients, nurses play a critical role in patient's treatment and ultimately their outcome. Among the long list of fulfilling aspects of a career as a nurse is the opportunity to provide support and care for patients and their families in situations the range from joy to sorrow. Nurses who are knowledgeable, confident and present will be able to instill trust and hope in their patients in what can often be a hectic healthcare environment. Shifts can quickly become chaotic, but it's important to remember to always take a moment to step back and spend some extra time with the patient to involve them in their recovery or simply help make their day brighter. As the U.S. healthcare system undergoes changes, nurses are increasingly becoming a stakeholder in ensuring that healthcare facilities avoid mistakes. Studies show that 42% of healthcare-related life-threatening events and 28% of adverse medication reactions are preventable. Nurses play a vital role in preventing incidents from occurring that could impact patient health. As a nurse, the reality is that the possibilities for errors are endless. Commit in the new year to take extra time to thoroughly screen for any potential risks. Opioid addiction and overdoses has risen dramatically over the past two decades. As direct-care providers on the front lines of the healthcare systems, registered nurses can help tackle this public health crisis. Nurses play a leading role in evaluating, diagnosing and managing patients dealing with opioid addictions as well as helping educate patients about alternative pain treatment options in order to prevent opioid dependency. Invest time in educating yourself on this public health crisis and become an advocate for a holistic approach to non-opioid pain management alternatives. In 2019, commit to leading a culture change around opioid prescribing and dependency. Advancements in healthcare technology software and devices are moving at a rapid pace. In order to keep up, nurses must stay informed. These technological advancements can improve the quality of care for nurses, promote team collaboration and communication, and provide secure access to patient information. However, devices and software vary between facilities. It's crucial for nurses to be adaptable to new systems and equipment. Commit this year to becoming more active in your facility. While it's important to communicate with patients, it's just as important to communicate with your fellow nurses, as you're playing on the same team. Whether it's through connecting with your unit, attending more meetings, or setting up new procedures, be open to learning from each other. Aim to become a trusted and respected nurse in your facility by going the extra mile. Beyond providing quality care for patients, professional success as nurses is measured by empowering others. If one of your 2019 resolutions is to start a new nursing career, apply now or contact one of our experienced nursing staffing specialists at (800) 879-4471. GHR is a top nurse staffing agency, and we look forward to working with you!